First time? Save time! Print and fill out this form prior to your visit. Multnomah Village Massage opened in May 2000 and serves clients from all across the metro area. We offer a wide variety of services including hot stone, therapeutic, sports, prenatal and deep tissue massage. Our office has a private parking lot and is located on Capitol Hwy with easily access to Tri-Met and local arterials. We look forward to seeing you soon. Treatment that promotes general relaxation, relieves tension, soothes sore muscles and improves circulation. Used to address chronically tense areas of the body. 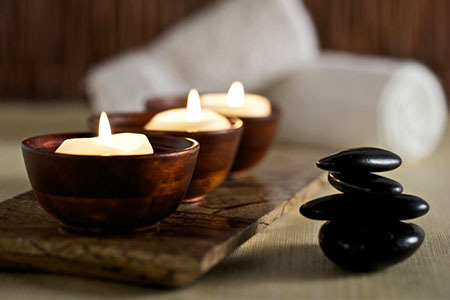 Deep tissue massage aims to release deep muscle spasms, relieves pain & alleviates dysfunction with slow, even pressure. Focuses on the special needs that arise during pregnancy. Reducing discomforts and concerns such as backache, swelling and leg cramps. Pregnancy massage enhances emotional well-being of both mother and baby. Extra care and attention are given to the mother’s comfort and stage of pregnancy featuring a specialized prego pillow & amazing body cushion both used to support relaxation at every stage; both before and after delivery. Stimulates points on the feet to promote an energetic balance throughout the body. These points correlate to areas of the body. "Wonderful massage, beautiful facility. Pamela is a top notch professional"
"I've been having body work done with Pammy for umpteen years now, and she is simply the best. I work on a farm, and when I'm really "crippled", she works it all out. I don't even have to tell her where it hurts. Her hands and elbows find the spots in my neck and shoulders that need the most attention." "Pamela's space is relaxing, very pleasant, clean and nicely appointed. I felt comfortable, and well taken care of by her, and have already started recommending her to others."